Another fantabulous recipe from The International Cookbook for Kids by Matthew Locricchio. The description reads, “Minestrone means ‘big hearty soup’. 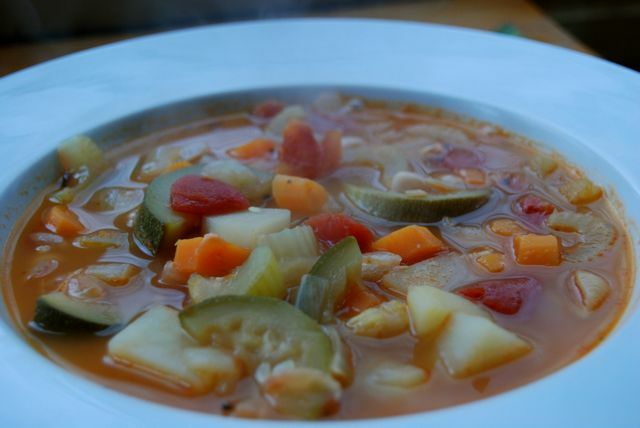 You will find different versions of this soup in every region of Italy. This classic recipe comes from Piedmont, in the north of Italy, and is considered by many Italians to be their country’s most famous soup.” And with good reason. This simple soup is packed with flavor and healthful ingredients, and the potato and beans make it filling enough for a meal. Measure the butter and olive oil into a stockpot and melt over medium-low heat. Add the onion and garlic and cook, stirring, 5 minutes. Add the potatoes, carrot, celery, zucchini, cannellini beans, tomatoes and pepper. Stir well and cook 10 minutes, stirring occasionally. Add the broth and herbs, stir to combine. Raise the heat to high and bring to a boil. Skim any foam that rises to the top and discard. Once boiling, reduce heat to low, cover pot with the lid slightly ajar, and simmer gently 30-40 minutes. Add pasta, raise heat to medium, and cook another 10 minutes, until pasta is tender. Remove from heat and serve immediately. This entry was posted in Soup, Vegetarian. Bookmark the permalink.